Updates to the A+2, Stereo Mixers, Glitch Pad and more on Patreon! We’ve just released updates to some of our favorite modules on Patreon. These updates are available to all of our patrons. A+2 now has filters. Users can now set a lowpass, highpass, low shelf, high shelf, band pass, notch, or resonant filter for your synth, and can modify the parameters of the filter. This makes it possible to craft even more compelling sounds, and to have the sounds change over time. A+2 now has more LFO options. LFO 1 can control the new filter, and LFO 2 can control the rate of LFO 1. LFO phase can now be set. LFO rate can sync with the master metronome or be set manually like before. A couple of new LFO waveforms have been created. A+2 is now more CPU efficient! I have found several ways to reduce the CPU load for the synth so that polyphony is not as demanding as it used to be. 4/8/16 Stereo Mixer modules are now more CPU efficient, making them a resource-cheap way to mix signals across your project. Stereo Mixer modules can now output to two locations, instead of one. This brings them in-line with the rest of the sound modules list. Stereo Mixer modules now include controllable stereo positioning / panning – instead of choosing to position each channel in the left, right, or center speaker, users can now position the signal between the channels in any amount, making complex stereo mixes possible, and making it possible to ‘pan’ sound around two channels in performance. Signal-In Control now has stereo positioning / panning. Like the Stereo Mixer modules, users can now route signals through the Signal-In Control module to position sounds and move sounds between the left and right stereo channels. Glitch Pad can now swap audio files. The bug where the Glitch Pad could not change audio files has been resolved. Metro Automator can start events simultaneously. A bug where only one automation parameter could be executed at a time has now been fixed. Remember, these updates are being distributed in a pre-release state. The pre-release versions are shared as a thank you to our community, and to our supporters. They might contain bugs, and might not be the same as the versions that are released in the official update. All of these updates will become available to everyone, whether you are a patron or not, in the next official MSDP release. If you enjoy the software, join us on social media and share your thoughts. We’ve got a facebook page, a twitter account, a subreddit, and a YouTube channel, and we love engagement on all fronts! If you really love what we’re doing, please consider becoming a donor on Patreon, where you can download custom-built presets, boards, and projects, and where you can get early-access to new modules before they make it into the next release. If you prefer to give a one-time gift, you can use the 'Donate' button to send us a donation of any size via PayPal. To sign off, I’d like to say thank you to our users for your belief in our project, and for all of the contributions to the MSDP community. Your engagement gives this program purpose, and inspires us to continue working. -Hugh Lobel, and the Music_SDP team. 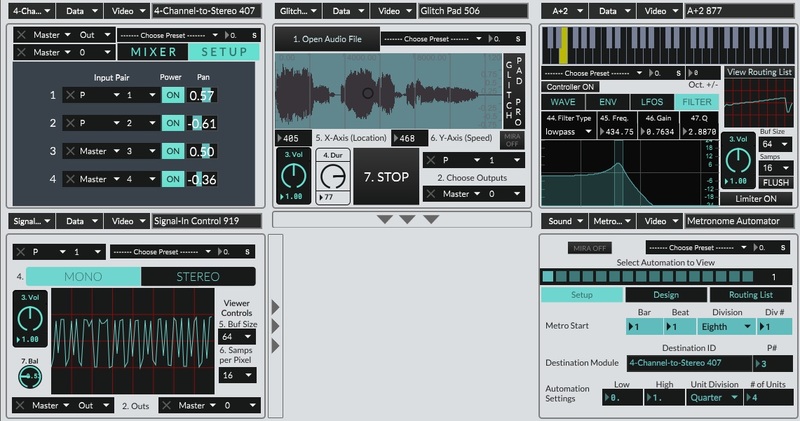 The Music and Sound Design Platform is 100% free and completely open-source. MSDP utilizes the GNU General Public License v3. 'The Music and Sound Design Platform' and 'MSDP' Copyright © 2015-2019 Hugh Lobel. All rights reserved.